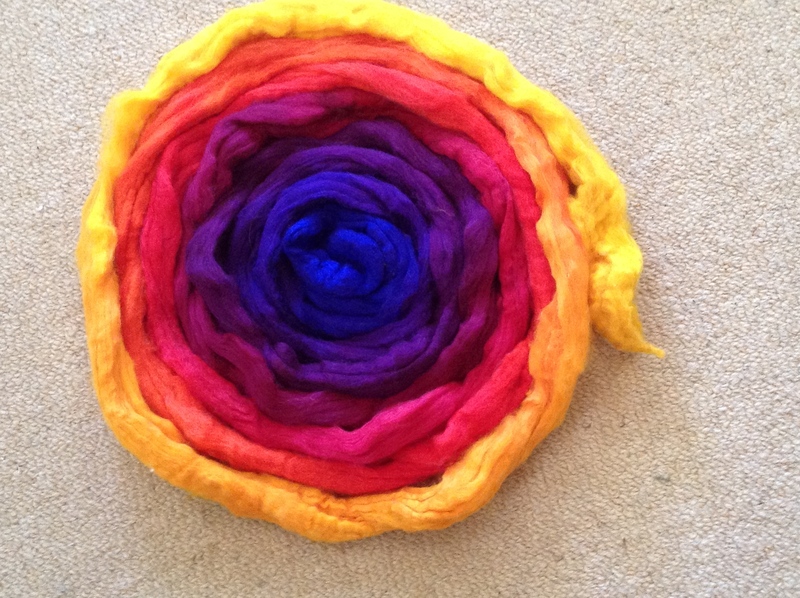 Spinning is much more complex than just spinning the wool so that it is even in thickness. 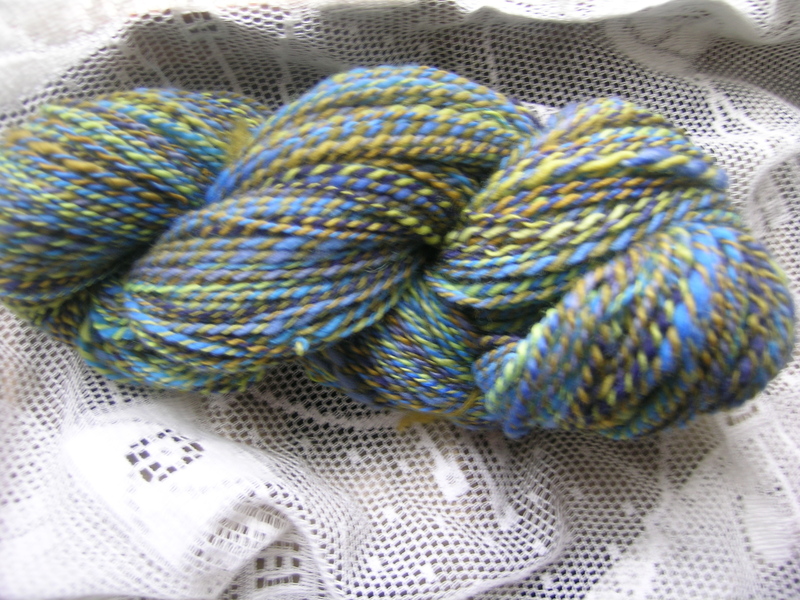 I have really been focusing on spinning a very fine single, as I prefer to knit with finer yarns. 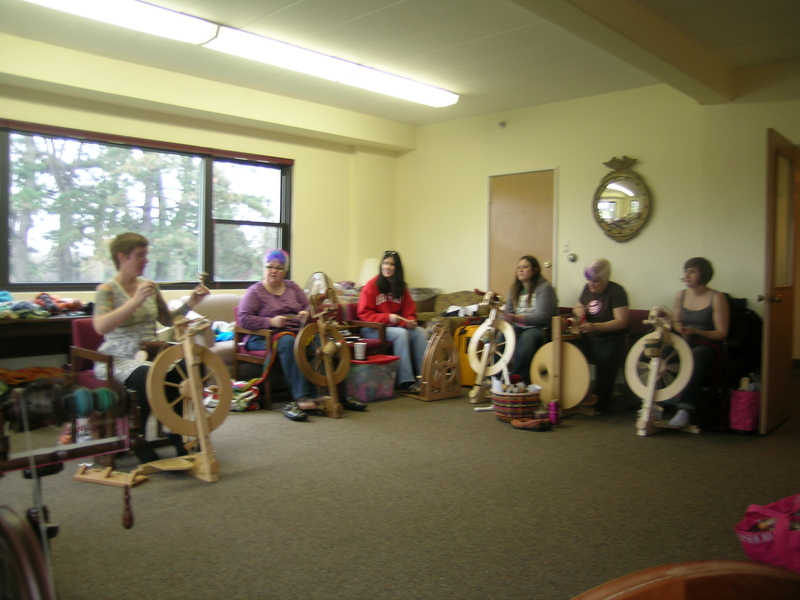 Then comes the plying, taking 2 or more bobbins of singles together and spinning them on the wheel in the opposite direction (usually counter-clockwise) to make a plied yarn to knit with. 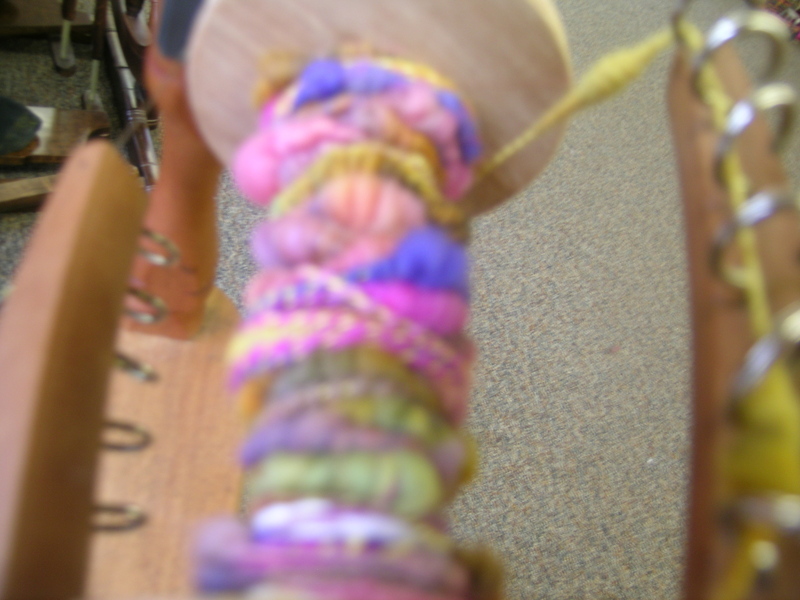 The goal is plying with just enough twist to counter balance the twist in the singles. I found this article to be very helpful. I like her approach much better than some of the others which require a test sample washed and dried, or lots of complicated formulas. 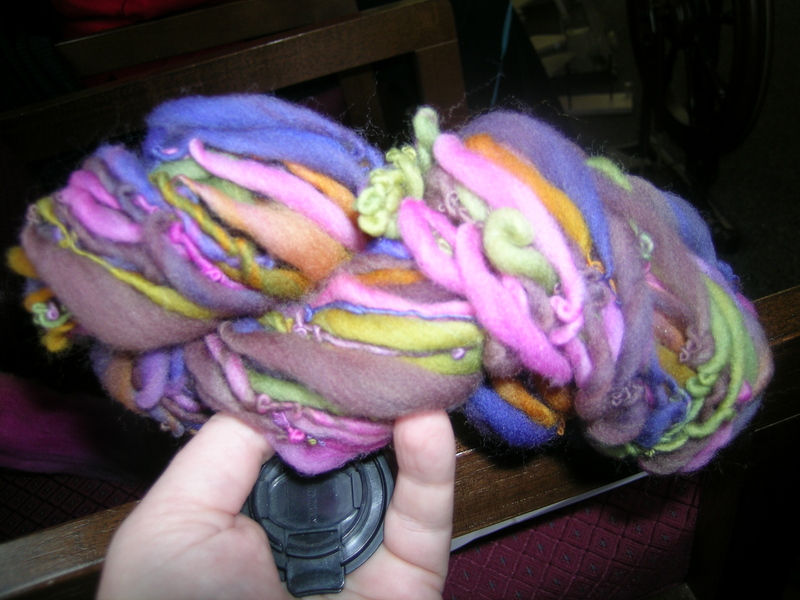 My guess would be that the spinners of old had an intuitive sense of when the yarn was correct. 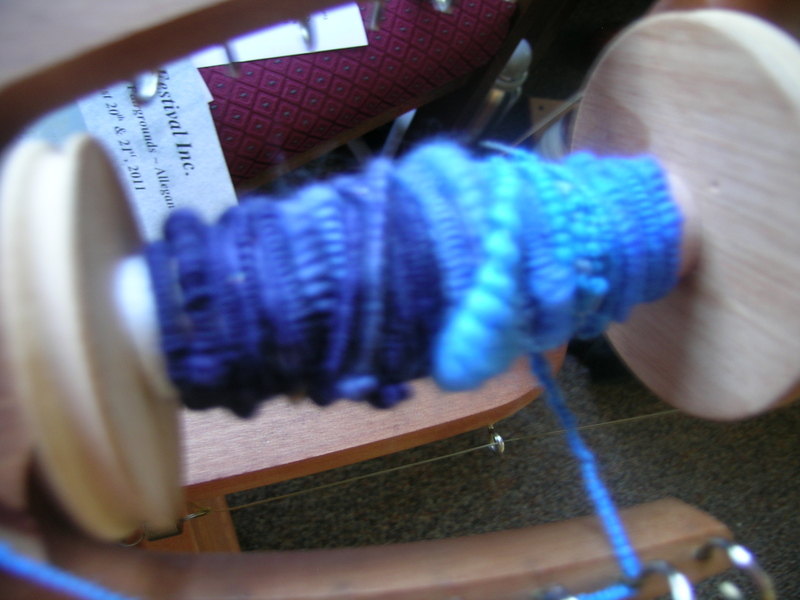 If you have too little twist in the plied yarn, it will twist back on itself and not be a very well structured yarn. Too much twist will also twist on itself. 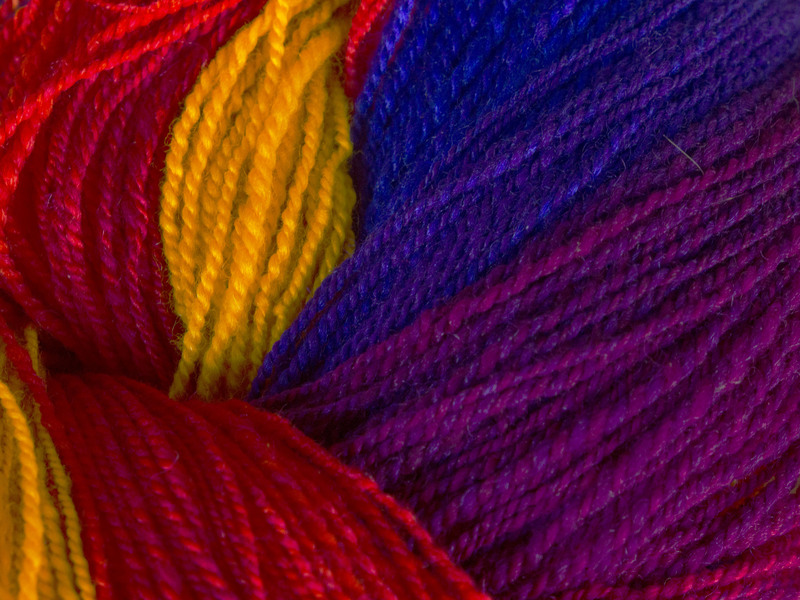 Both result in a yarn that knits with an angle and you do not achieve a straight knitted fabric. The above linked article does a very good job of demonstrating this. So, I had these 2 rovings that I then spun into singles. 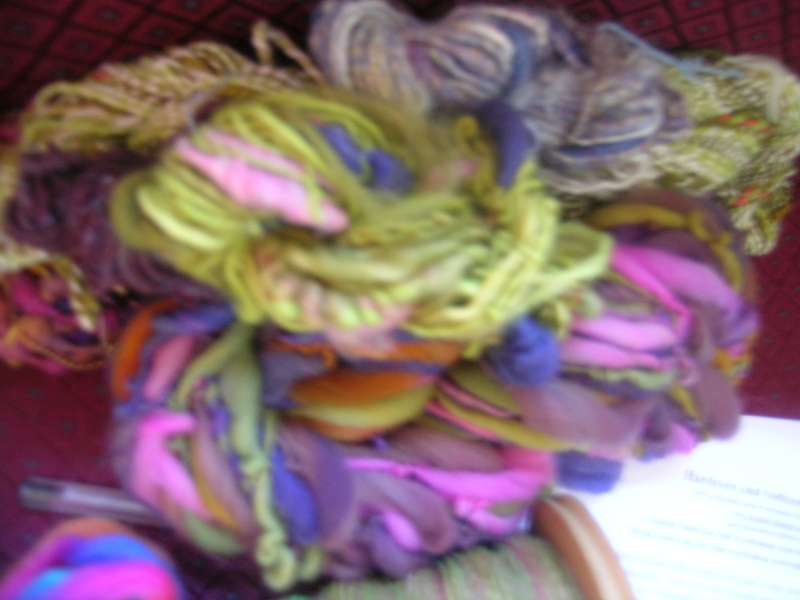 I had used bits of both of them at my Insubordiknit spinning weekend, so did not have a lot to make a skein of just one or the other. 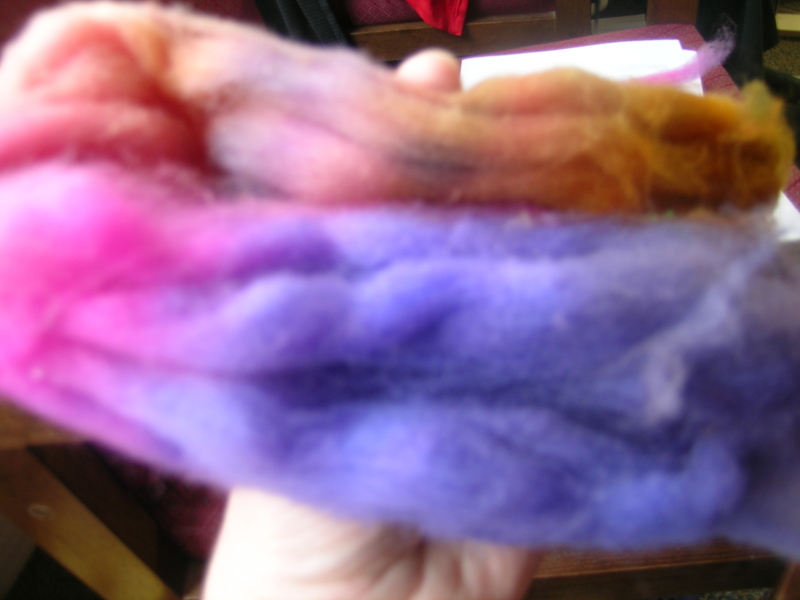 This is fiber that I purchased from the Dizzy Sheep spinning weekend sale few weeks ago. 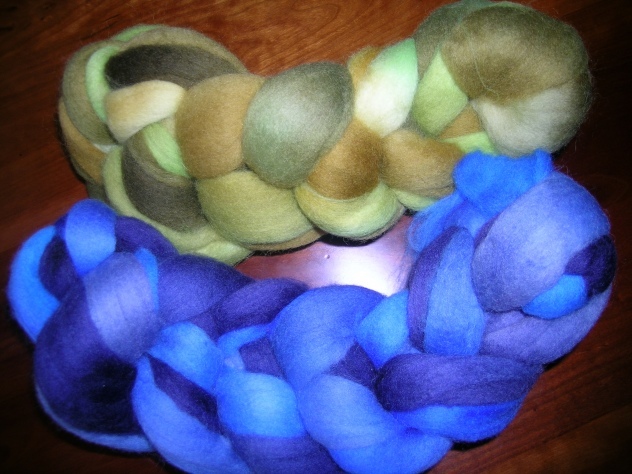 These are 4 oz hand painted Merino tops from Spinner’s Hill. Colors are Blue Glass and Olives. So, after spinning the singles, I chose to ply these together. 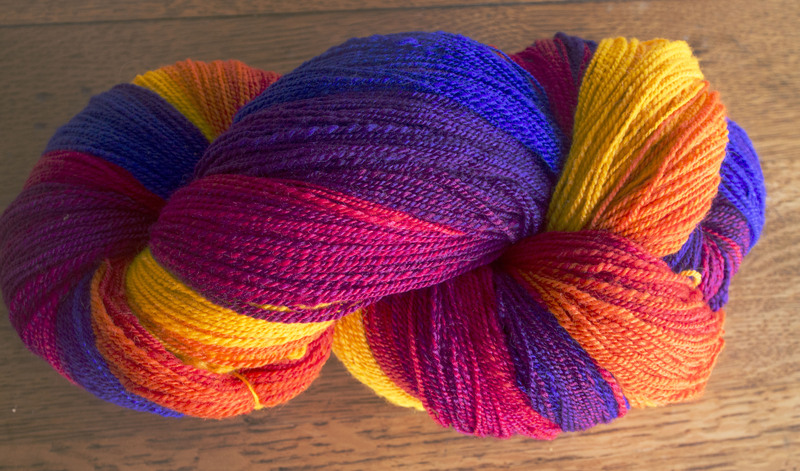 I am quite happy with the results, and I really did achieve a nicely balanced yarn! 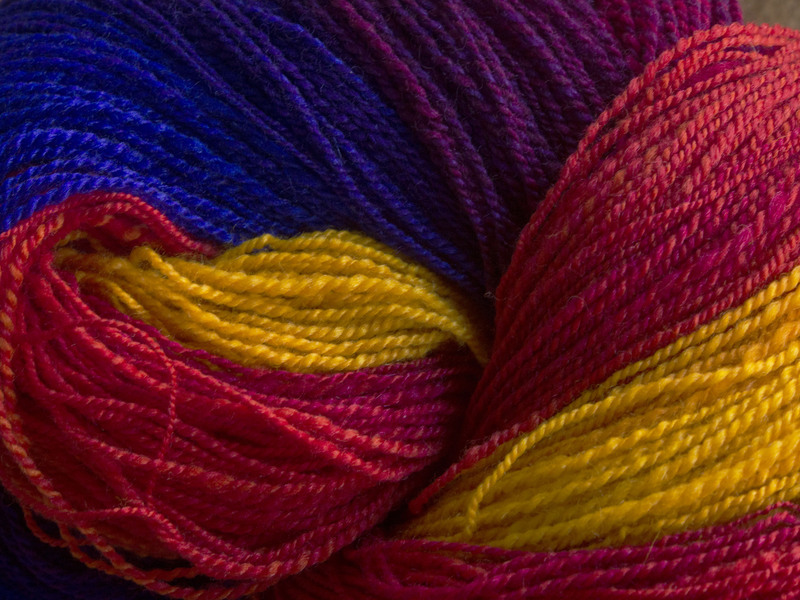 There are still some inconsistencies in the spinning of my singles, but I am quite happy with the outcome both in terms of color and how the yarn feels. 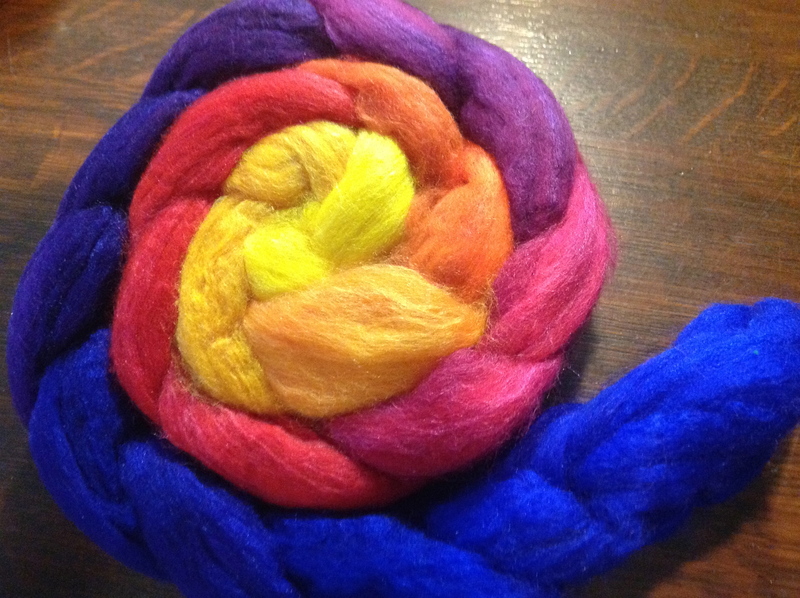 This is being gifted to a dear friend who is a great spinning supporter for me. 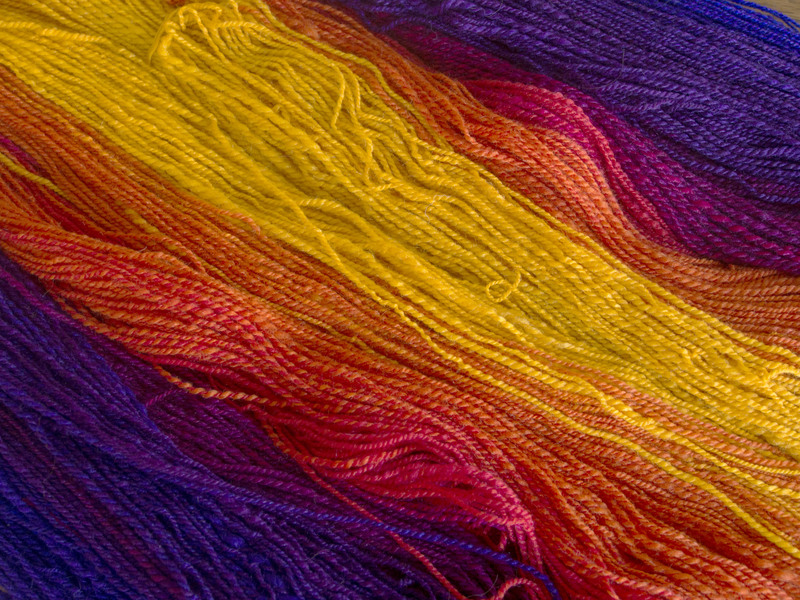 Spinning Art Yarns that is. 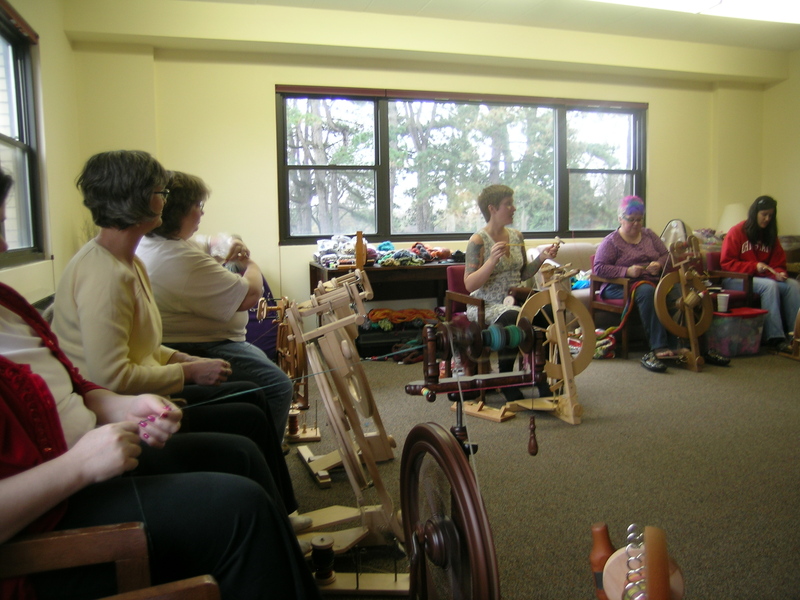 I just returned from a weekend spinning retreat with Jacey Boggs. 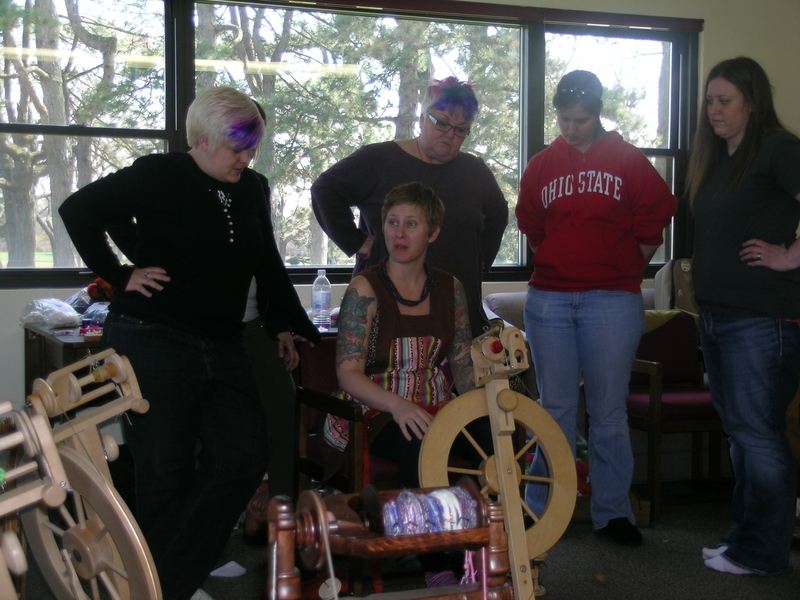 She is known for spinning art yarns, and that is what this retreat was about. 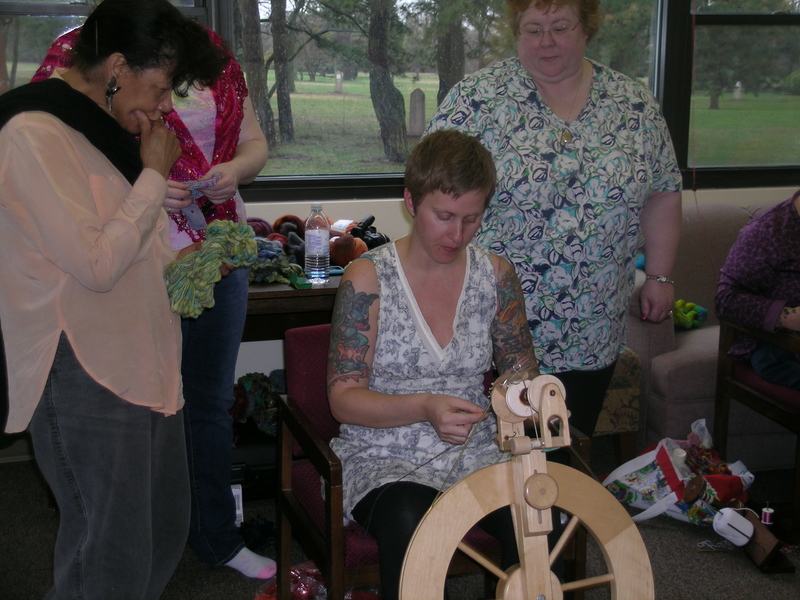 Manning had asked me why I would want to take this class, since the yarns are really nothing that I use in my own knitting. 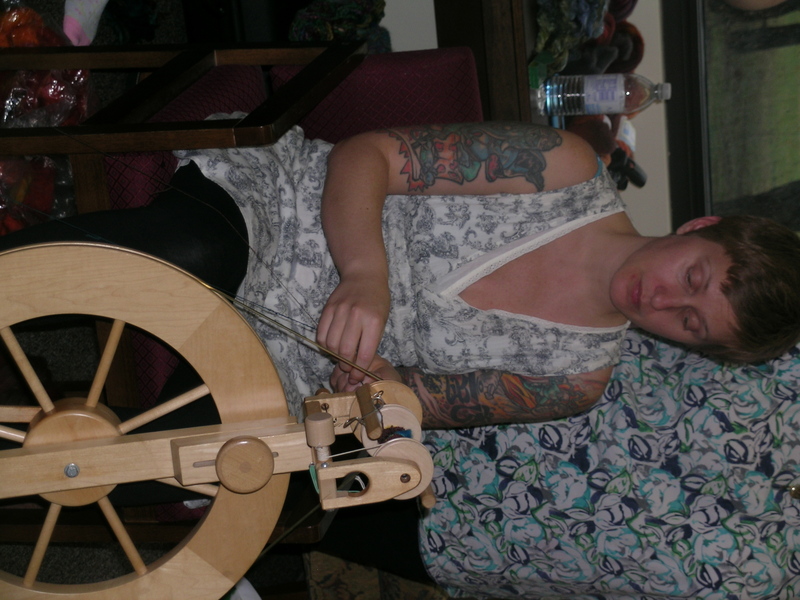 My response to her was that I am trying to master spinning, and this would improve my skill set. It did. Jacey is a very good technical teacher. At first I was a bit intimidated by the other attendees knowledge, spinning vocabulary, and past works. But, I persevered. 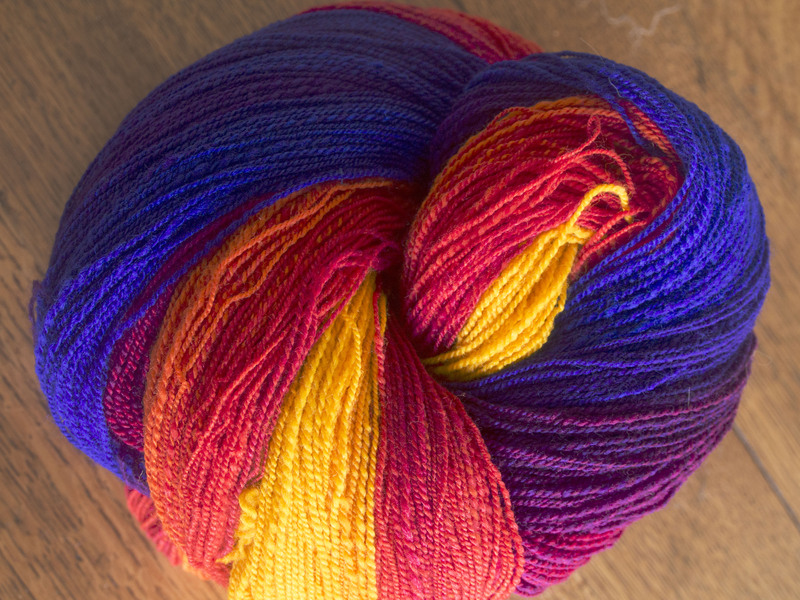 I am a fabulous knitter (self-proclaimed of course), and thought that I should be able to get this skill honed also. I was right, and impressed my self with what I was able to accomplish with a few short hours of instruction. 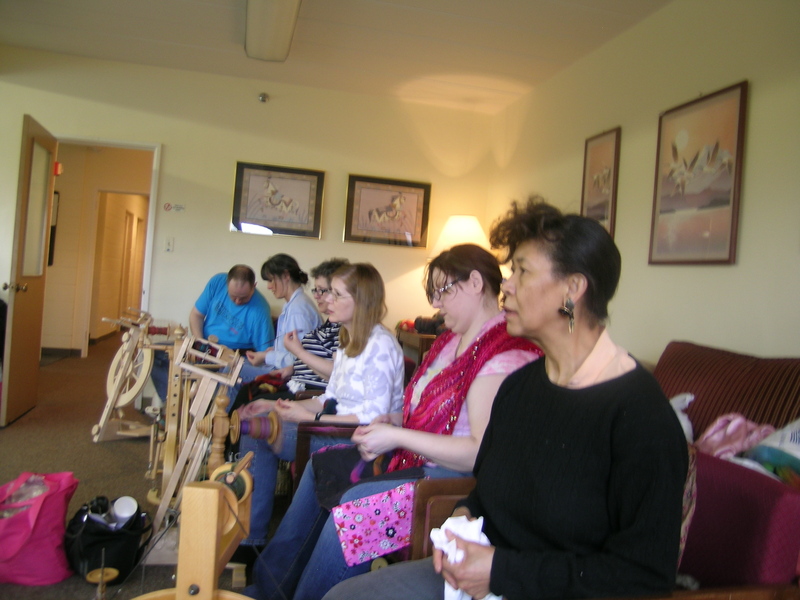 While at times it was frustrating for me, I have a successful section of every type of yarn we practiced spinning. Here are some photos fresh from the retreat. It was a very lively group, with some memorable personalities. 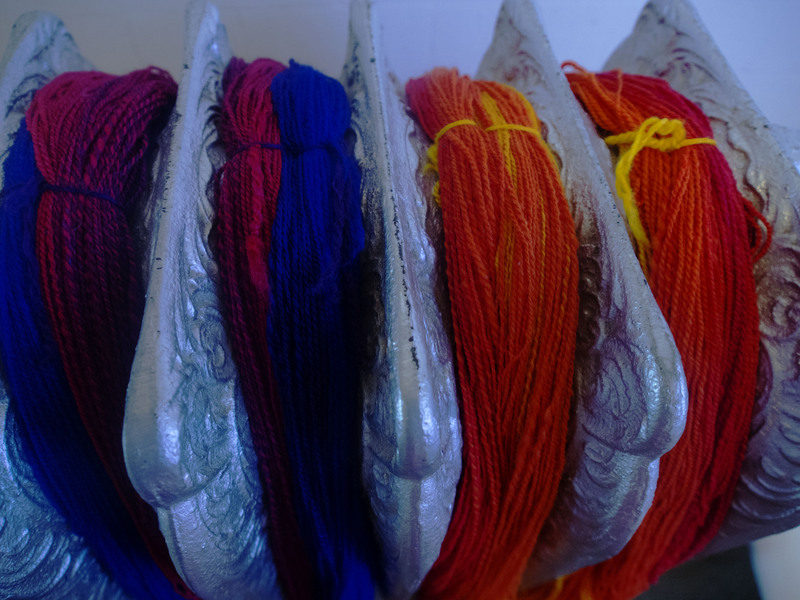 My yarns have all had a hot bath, and are hanging to dry. I will post and explain more about the techniques tomorrow.